Tired of a market dominated by industrially brewed lagers and ales, the team behind BrewDog set up the world’s first crowd-funded brewery in 2007. Now operating from a site in Ellon, just north of Aberdeen, a community of over 35000 investors own shares in the business, with shares still available. And what’s more, the brewery that’s made for the people, by the people is still constantly striving to encourage passion for craft beer. Alongside the brewery’s line up of six core beers, a special ‘Amplified’ range is also available, comprising two beers – ‘Jack Hammer’ and ‘Elvis Juice’. 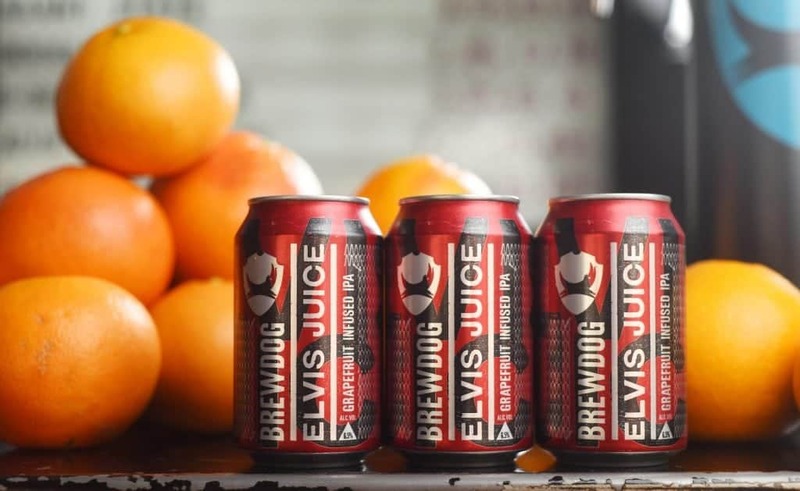 Brewed with a blend of five hop varieties (Amarillo, Citra, Magnum, Mosaic, and Simcoe), what’s most prominent about Elvis Juice is the judicious amount of grapefruit pith that’s also used within the brewing process. As a result, the grapefruit – alongside the hops – offers a citrus overload, balanced by the use of caramel malt. On the nose, obvious huge grapefruit aromas are joined by notes of passionfruit, orange and pine, while the grapefruit also continues onto the palate and is joined by a hoppy bitterness that follows into the beer’s clean finish, with prominent notes of refreshing, bittersweet grapefruit. BrewDog’s Elvis Juice is available to buy from brewdog.com.